Pacer Mohammad Abbas took five wickets as Pakistan dismissed Australia for 145 runs on the second day of the second Test in Abu Dhabi on Wednesday. Abbas dismissed Shaun Marsh for three runs, Travis Head for 14 and Mitchell Starc for 24 runs to derail Australia after they resumed at 20-2 in reply to Pakistan's 282 all out at Sheikh Zayed Stadium. Bilal Asif removed Aaron Finch (39) and in the last over before lunch trapped Tim Paine leg-before for three as Australia were left in danger of conceding a big first innings lead. He then had Head caught in the second slip to leave Australia at 56-4. Yasir Shah made it 75-5 with the wicket of Mitchell Marsh, caught close to the wicket for 13. After the break, Marnus Labuschagne went back after scoring 14 runs after being run out by Shah. He was soon followed by Nathan Lyon who became Asif's third victim of the game. Before the close of play on day one, Pakistan had grabbed two wickets, including that of Usman Khawaja for three, as Australia finished on 20 for two, with Aaron Finch on 13 and nightwatchman Peter Siddle dismissed off the last ball of the day for four. Fast bowler Abbas had Khawaja — who scored a fighting 141 to lead Australia's fightback for a draw in the first Test in Dubai last week — caught behind for his 50th Test wicket in 10 Tests. Abbas became joint second-fastest Pakistani to the milestone of 50 wickets with Waqar Younis, Mohammad Asif and Shabbir Ahmed. The record is held by team-mate Yasir Shah who completed 50 wickets in nine matches. 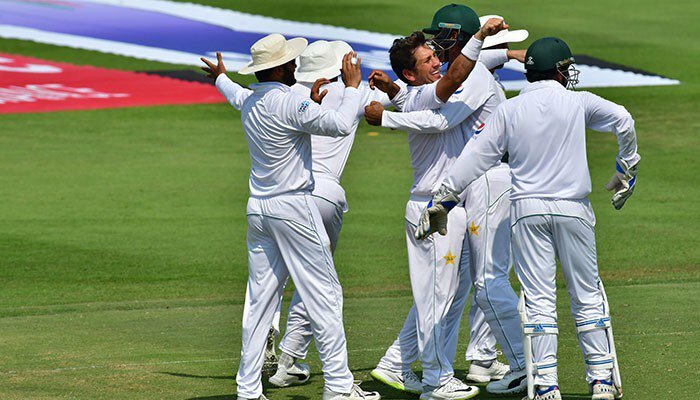 Earlier, debutant opener Fakhar Zaman and skipper Sarfraz Ahmed found form with fighting and innings-reviving knocks, taking the attack to the Australian bowlers after spinner Nathan Lyon had rocked Pakistan in the morning, reaching lunch with figures of 4-12. Fakhar hit eight boundaries and a six in his enterprising knock as he and Sarfraz added 147 runs. Fakhar was trapped leg-before by leg-spinner Marnus Labuschagne for 94, becoming the fourth Pakistan batsmen to be dismissed in the 90s on his debut. Sarfraz then holed out to Labuschagne, who finished with 3-45. Sarfraz hit seven boundaries in his 94. "Yes, it is disappointing to miss a hundred but I am happy the way we revived the innings and then got two wickets, including that of Khawaja, so for me it is an even position," said Sarfraz who was hit on the left forearm by a rising delivery from Mitchell Starc. "At the moment I am feeling discomfort and if there is swelling tomorrow then we can summon reserve wicketkeeper as per the new rules," said Sarfraz. Pace bowler Starc provided Australia with an early breakthrough earlier in the third over when Mohammad Hafeez fell to a freakish catch at short leg by Labuschagne for four.